The Truman State University Career Center has several upcoming activities including a lounge opening and events in preparation for the Career Expo. The Target Lounge will have its grand opening from 10 a.m.-2 p.m., Feb. 24, in the Career Center. Student art work will be on display. There will be a reception for the art students who are showing their work in the lounge from 3-4 p.m., Feb. 24, in the Target Lounge. All are welcome to attend. The Target Lounge will provide students a more comfortable space for researching their career options. Employers from Steak n’ Shake and Eli Lilly will be conducting mock interviews Feb. 28 in the Career Center. These interviews will offer an opportunity for students to practice their interviewing skills and get feedback from employers. Students can sign up for a time slot in the Career Center this week. The Career Center also is sponsoring several events Feb. 28 to help students prepare for the upcoming Career Expo. Debbie Thompson from Steak n’ Shake will be talking about “How to Work a Career Fair” from 5:30-6:30 p.m., Feb. 28, in the Student Union Building Activities Room. She also will answer questions students may have about what to do and/or expect at the Expo. An internship panel will be answering students’ questions on obtaining an internship from 6:30-7:30 p.m., Feb. 28, in the Student Union Building Activities Room. The panel will be comprised of a Career Center representative, May Co. recruiter Jaime Geer and students. Larry Frey of Eli Lilly will be speaking at 7:30 p.m., Feb. 28, in the Student Union Building Activities Room. He will be explaining “How to Ace the Interview.” He will be offering insights into how to make the best impression at a job interview. The Career Expo will be from 1-5 p.m., March 1, in the Student Union Building. For more information about any of these events, go to http://career.truman.edu or call 785.4353. The 37th annual Truman State University Phi Mu Alpha Jazz Festival will present Matt Wilson and the Arts and Crafts Quartet at 7:30 p.m., Feb. 26, in Baldwin Auditorium. The members of the Arts and Crafts Quartet include Matt Wilson, drums; Ron Miles, trumpet; Dennis Irwin, bass; and Larry Goldings, piano. Wilson is considered one of the most imaginative jazz artists of his generation. His creativity, versatility and open mind keep him in demand worldwide as a sideman, bandleader and educator. He performs in many bands including those of Dewey Redman, Cecil McBee, Ray Anderson and numerous others. Wilson has appeared in more than 75 albums as a sideman and plays on many soundtracks and jingles. His own albums on Palmetto records are critically acclaimed. This event is sponsored by MAC, FAC and the Truman Division of Fine Arts. Admission to this performance will be $6 for adults, but will be free to students with University IDs. Contact Tim AuBuchon at 785.4412 for more information. Aaron Fine (left), director of the University Art Gallery, and Sujit Chemburkar (right), director of the Student Union Building, are pictured with (second from left to right) Kate Sherron, senior art and psychology double major from Florissant, Mo. ; Lisa Payne, senior art major from Manchester, Mo. ; and Ellie Goedeker, senior art major from Ballwin, Mo. Sherron, Payne and Goedeker all had artwork chosen. The Student Union Building has again purchased art from several Truman students to add to their permanent collection displayed throughout the building. Artwork by Kate Sherron, senior art and psychology double major from Florissant, Mo. ; Lisa Payne, senior art major from Manchester, Mo. ; and Ellie Goedeker, senior art major from Ballwin, Mo. ; was chosen. Two theater productions will be performed next week. The Truman State University Opera Theater will present “Hansel and Gretel” at 8 p.m., March 1-4, in the Ophelia Parrish Performance Hall. Tickets are $5 for the general public and $3 for students. Tickets will be on sale in the lobby of Ophelia Parrish each day of the performance and at the door. Call the Division of Fine Arts Office at 785.4417 for more information. In addition, the Division of Fine Arts will present the musical “Cabaret” by John Kander and Fred Ebb, directed by Lee Orchard. The show will be at 2 p.m., Feb. 27, 8 p.m., Feb. 28 and 8 p.m., March 2-4, in the Ophelia Parrish Courtyard Theatre. Tickets are $5 and may be reserved or purchased in advance at the Ophelia Parrish box office. Limited special seating is also available for $10. For details or further information, call the Ophelia Parrish box office at 785.4515. Due to graphic content, this production is not recommended for children. The Society of the Prim Roses is hosting a movie trivia night, "Whose Life is it Anyway?" from 6-9 p.m., March 2, in the Baldwin Auditorium. Teams and audience members will have the opportunity to compete for prizes. The cost for entering a team is $10. Tickets will be available in the Student Union Building from Feb. 22-25 and are $3. Tickets also will be available at the door. All proceeds for the event benefit the Holden Comprehensive Cancer Center. For more information, or to register a team, contact Erin Clark at 785.5951. For more information, visit the Prim Rose Web site at http://primroses.truman.edu. Rotary Ambassadorial Scholarship applications are due Feb. 25. The scholarship provides transportation, tuition, room and board to a student from the United States to study abroad for one academic year. The applications are available online at http://www.rotary.org, and can be turned in to Marilyn Romine in Violette Hall 2464 or to Mark Hanley in Baldwin Hall 255 by 5 p.m. Feb. 25. Students may contact Romine at 785.4268 for more information. Students now can apply to be a Student Ambassador for the 2005-2006 academic year. Student Ambassadors is a group of approximately 150 Truman students who volunteer one hour a week to give tours to prospective students and their families. They are upbeat, outgoing, well-spoken and dedicated to helping the Admission Office in representing the University to visitors. Applications are available in the Admission Office located in McClain Hall 205. Applications are due by 3 p.m., March 1, in the Admission Office. Interviews will be conducted March 7-11. For more information or questions, contact Micah McKay at 785.4114 or micah@truman.edu. Several staff members received the Glen Yardley award for 2004. Pictured front row, left to right: Randall Shafer, facilities housekeeping and Lillian Jackson, academic housekeeping. 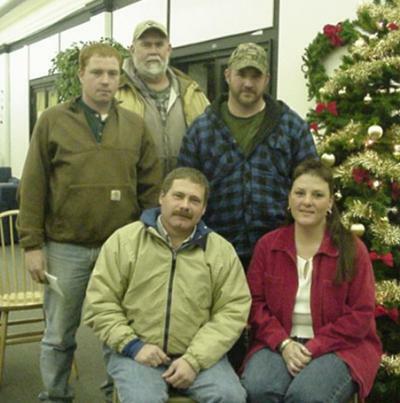 Back row, left to right: Dave Cameron, mechanical services; Vern Hall, grounds; and Bryan Waddle, building services. Kelly Bryant, powerplant, is not pictured. The Financial Aid Office has announced several scholarship opportunities that are available. The Sallie Mae Fund is offering a variety of scholarships to low-income and minority students for the 2005-2006 academic year. Scholarship criteria, applications and deadlines for 2005 are now available for download from the Sallie Mae Fund’s Web site at http://www.salliemaefund.org. The National Institutes of Health (NIH) has scholarships available. The NIH offers up to $20,000 a year in scholarship support, paid research training at the NIH during the summer and after graduation, and intensive mentoring, research experience, career guidance and skill development. Basic requirements include: U.S. citizen, national or qualified non-citizen and be enrolled or accepted for enrollment as a full-time student for the 2005-2006 academic year at an accredited undergraduate institution. Additional requirements are that the student must be from a disadvantaged background, which means that their financial aid office has certified them as having exceptional financial aid need, and they must have a 3.5 GPA or higher or be within the top five percent of their class. For more information and to apply for the scholarship, go to http://ugsp.info.nih.gov. Deadline for applications is Feb. 28. The Federated Garden Clubs of Missouri offer scholarships up to $1,000 to qualifying junior, senior or graduate students enrolled in a Missouri college or university who are majoring in horticulture, floriculture, landscape design, botany, plant pathology, forestry, agronomy, environmental concerns, city planning, land management or allied subject. Scholarships up to $3,000 are also available through the Ernest and Lillian Swanson, the Tex Neuner and the Ida Morrow Scholarship Trust Funds to qualifying freshman, sophomore, junior, senior or graduate students who are Missouri residents and are enrolled in any accredited college or university. The student must be studying botany, plant genetics or related subject. Another scholarship offered by the Federated Garden Clubs of Missouri is the Virginia Thomas Scholarship, which is available to a foreign student studying horticulture or related field at a Missouri college or university who is planning to return to his or her own country after graduation. This student must be a junior, senior or graduate student who is recommended by the college or university. Visit the Truman State University Financial Aid Office for an application for any of the Federated Garden Clubs of Missouri scholarships. Deadline for scholarship submission is March 1. The physics department is presenting a series of five public lectures in celebration of the World Year of Physics 2005 and the 100th anniversary of Albert Einstein’s "Miracle Year." Each hour-long talk is appropriate for a general audience and will be followed by refreshments. For more information, visit http://physics.truman.edu or call Matt Beaky at 785.4594. Women from all academic majors are encouraged to apply. Contact Truman’s Undergraduate Office of Admission, McClain Hall 205 or call 785.4114. The 2005-2006 Free Application for Federal Student Aid (FAFSA) is available on the Web at http://www.fafsa.ed.gov. Students should apply soon to be considered for all available federal and state funds. Contact the Financial Aid Office, MC 103, 785.4130, for more information. "Race Identity and Experiences Across the Black World"
Educator of the Year nomination forms are now available in the Student Senate Office and online at http://www.tsusenate.org. Completed forms need to be returned to the Senate Office by Feb. 25. Paula S. Cochran, professor of communication disorders, delivered an invited presentation titled “Advanced Language and Literacy: Integrating Computers into your Therapy” at the annual convention of the Illinois Speech-Language-Hearing Association in Chicago, Feb. 12. Lauren Rosenfield, English graduate student from Lee’s Summit, Mo., will have her first publication, “Found in Translation: Céline, Chum, and Chickens, An Interview with Author Mark Spitzer” in Jack Magazine’s spring 2005 issue. John Strong, director of the Missouri Campus Compact, will speak at the Weekly Lunch Series from 12:30-1:30 p.m., Feb. 23, in the SUB Spanish Room. This program is sponsored by the Center for Teaching and Learning. Call 785.4391 for more information. Students In Free Enterprise (SIFE) is having a guest speaker at 6:30 p.m., Feb. 23, in VH 1010. Sandra D. Marks will speak about her experiences an an entrepreneur. Everyone is welcome toattend. For more information, call Elizabeth Milford at 665.2615. The Center for Teaching and Learning is sponsoring a Global Issues Colloquium about Africa’s economic policies, OPEC and the debt crisis at 7 p.m., Feb. 24, in VH 1000. Call 785.4391 for more information. Students interested in teaching conversational English in China next year should attend an informational meeting at 7 p.m., Feb. 24, in VH 2351. The experience is offered as a 12-hour internship. Contact Amy Peebles at apeebles@truman.edu or Tim Farley at tfarley@truman.edu for more information. Kip Deeds will give a slide presentation on his artwork at 8:30 p.m., Feb. 24, in OP 2210. Deeds currently teaches print making at Princeton and has taught various art classes at several institutions. Afterwards, Deeds will be available for discussion and critique. The University Observatory will be open to the public from 8-10 p.m., Feb. 24 weather permitting. Omega Delta Kappa Student Hall of Fame nomination forms are available in the Center for Student Involvement and division offices. Any faculty, staff or student can nominate an outstanding senior for the award, which will be announced at the Leadership Recognition Night. Applications are due in the ODK mailbox Feb. 25. Contact Lukin T. Murphy at 785.7143 for more information. MAE and Counseling students interested in a 2005-2006 full-year Teacher of Record Internship in a metropolitan area are invited to attend an informational field trip to Kansas City 74 School District in Kansas City, Mo. Transportation will leave at 7 a.m., March 3, from the Public Safety Building and return at 6 p.m. Internships in the program include a full first-year teacher salary, on-site mentoring and coaching and beautiful living accommodations at a reduced cost. Students accepted into the program must make a two-year commitment to teach in the Kansas City 74 District. To reserve a spot by Feb. 25, stop by the Education Division Office in VH 2300 or call 785.4383. For more information, call Dale Blesz at 785.4398. Beta Alpha Psi is participating in the Volunteer Income Tax Assistance Program (VITA) to provide community members with free electronic tax filing. They will be offering their services from 8 a.m.-3 p.m., Feb. 26 and March 5, in VH 1424. Go to http://bap.truman.edu for more information. The second basketball “SpiritFest” will be at noon, Feb. 26, in the RH Main Lounge. The theme is “Paint Pershing Purple.” Enjoy free purple food, music, games and fun with Spike the Bulldog. The first 100 guests get a free foam paw. The Truman Volleyball Banquet, honoring the 2004 national runner-up team, will begin with a social at 6 p.m., Feb. 26. A dinner and program will follow. Cost is $12 per person or $5.50 for those 10 and under. Children three and under are free. For more information or to R.S.V.P., call the Volleyball Office at 785.4468 or e-mail clundy@truman.edu. The Center for International Education Abroad is sponsoring a Study Abroad Fair Feb. 28. Directors from host institutions abroad as well as Truman faculty will be available to discuss their programs with students from 10 a.m. to noon and 1:30-3:30 p.m. on the first floor of Kirk Building. The Center for Student Involvement is sponsoring a Brown Bag Lunch Workshop titled “Practically Perfect Publicity for Students and Advisers” from 12:15-1:15 p.m., March 3, in the SUB Spanish Room. The workshop will include discussion about proper, effective and creative event publicity with guest speakers from the Public Relations and Publications Offices. Call the CSI at 785.4222 for more information or to reserve your spot. The Graduate English Organization is accepting submissions for its second annual Environmental Studies Conference April 21-22. Abstracts of 200-600 words are due March 11. E-mail laurenr@truman.edu for more information on the conference. The Department of Public Safety is offering a shuttle to the LaPlata train station for midterm break. The shuttle will leave at 8:30 a.m., March 12, from the Public Safety Building, and pick up students at the train station March 20. Cost for the shuttle is $5 in advance with reservation for a specific date. Call Joyce Burnett at 785.4177 to reserve space on the shuttle to and/or from the LaPlata train station. The May 2005 Interim schedule is now available at http://www.truman.edu/pages/431.asp. Registration for May interim courses and workshops will begin March 21 and will continue through the first day of the May Interim. Because students must pay for these courses in advance, students may not register for these courses online. To enroll, students should bring a Permit to Enroll form signed by their adviser, along with proof of payment from the Cashier’s Window, to the Registrar’s Office between 8 a.m.-5 p.m. any day during this registration period. Truman State University’s study abroad program in Chambery, France, still has openings. Students will receive six credit hours for the program, which will take place May 29-July 2. Courses will be in French language and culture at the Institut Francais des Alpes. Lodging will be with French families. There will be excursions in the Alpine region and a trip to Paris. For more information, contact Patrick Lobert, MC 313A, 785.4062 or plobert@truman.edu. The Brashear Elementary After-School Program needs Truman students, faculty and staff to share their knowledge and talents with elementary students. This could be done through hands-on activities, displays, interactive presentations, performances or any other creative method in the form of a one-time or sequence of events or on a regular basis. Interested parties should contact Jenny Pawlowski at jenny_pawlowski@brashear.k12.mo.us. The Adair County Juvenile Office is looking for individuals to work with youth as a part of their mentoring program. For more information on this opportunity, stop by the SERVE Center or e-mail Staci at staci.eleazarraraz@courts.mo.gov. Student Senate Housing Guides are now available in the Senate Office free of charge for students. Phi Epsilon Kappa is now selling Bulldog wristbands. Contact Abby Souders at abbysouders@truman.edu to place an order. Individual wristbands cost $1 a piece.